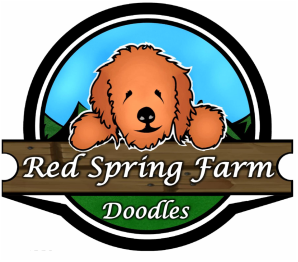 Welcome To Red Spring Farm of Central North Carolina! We provide health tested multigenerational Goldendoodles (and occasional ALD Labradoodles or Double Doodles) to loving pet homes throughout the United States. All of our adult breeding dogs live happy, indoor lives as an pet, first and foremost. All parents must pass rigourous health testing, and each puppy is raised in a clean, indoor, home environment with constant stimulation, socialization, and even basic training before going home with their forever families. Puppies go home vet checked, up to date on vaccines, micro-chipped, and with a two year health guarantee. Not all breeders are created equally, please do your research! Happy Browsing! Learn The Basics Of Goldendoodle Health Testing HERE. We encourage you to compare our health testing protocol with that of other breeders! ​We are confident that you will find that we are among the best in the nation!